This morning, Wild Blue untied from the docks at Roche Harbor, Washington and pointed her bow north, towards Vancouver, British Columbia, beginning another 3-month cruise up the Inside Passage to Alaska. 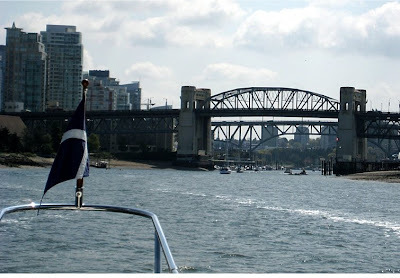 Pat and Alex enjoyed strong currents, flat seas and a sunny day on the 6-hour, 50-mile crossing of the Strait of Georgia, arriving in Yaletown, Vancouver just after noon. This morning’s wake up call came at 5:30AM and felt even earlier, since last night the Bensons celebrated their 28th (oh it can’t be that long) wedding anniversary with Selene owners Rhodes and Gordon. We’ve spent the last couple days at the 2009 Selene Rendezvous, a yearly gathering of Selene boats and their owners. This is where everyone congratulates every else on their wise boat purchase! We’ve been attending each of the last five Rendezvous, and it’s always fun to meet the new owners and get reacquainted with those we see just occasionally. Our 2009 Alaska cruise includes many of the same ports of call as last year: Central and Northern British Columbia, Prince Rupert, Ketchikan, Craig, Glacier Bay, Juneau, Tracy Arm, Petersburg and Wrangell. In addition new stops include Kake, Sitka, and we’ll cruise as far north as Lituya Bay, located on the Gulf of Alaska. We’ll be cruising alone, that is without a buddy boat this year, but some of the same crazy crew characters that entertained us last year will be crewing on the Wild Blue. You won’t want to miss the future Blogs about those Petaluma turkey ranchers, the Los Osos surfer-fishermen, the San Luis Obispo cowboys, and even the Captain Squire and First Mate Harriet of last year’s Alaska Cruiser Seagate (see www.baywoodinn.com/blog for the whole story). Once again we'll try to keep Capatin Squire's Mexico arrest record at bay from the Canadian authorities. And, this year we have some new crew faces too, such as Alex’s Cal Poly college roommates, who are guaranteed to keep our Blog readers highly entertained. 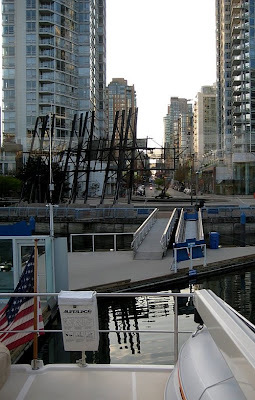 As we motored through the skinny passes and small bays of BC's Gulf Islands on our way to Vancouver today, we were quite surprised to come upon the New Century 1. This 700 foot long ship was anchored away from the shipping lanes in quiet Plumper Sound, just outside one of our favorite anchorages Winter Cove. 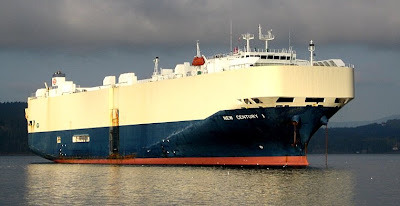 New Century 1 is the world's largest car carrier with capacity for 6000 automobiles. Based on how low it's sitting in the water, and the current economic crisis, it probably hasn't been able to offload all of it's cargo. 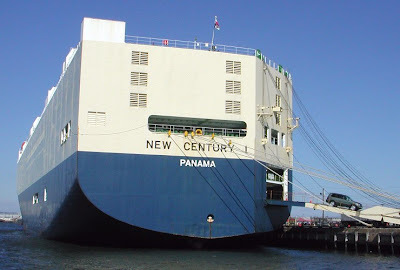 New Century 1 in better days offloading new vehicles. 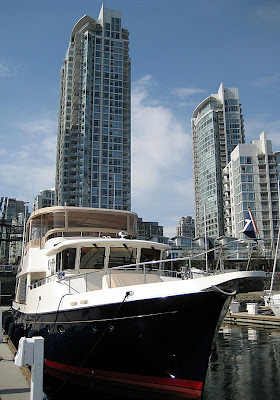 We moored in Vancouver's False Creek at Quayside Marina which looks straight up into Yaletown. We'll stay here just long enough for last minute supplies then move up the BC coast on Tuesday. A great view into the City from Wild Blue's boat deck. For this years cruise, we've completed our normal engine servicing and routine maintenance. 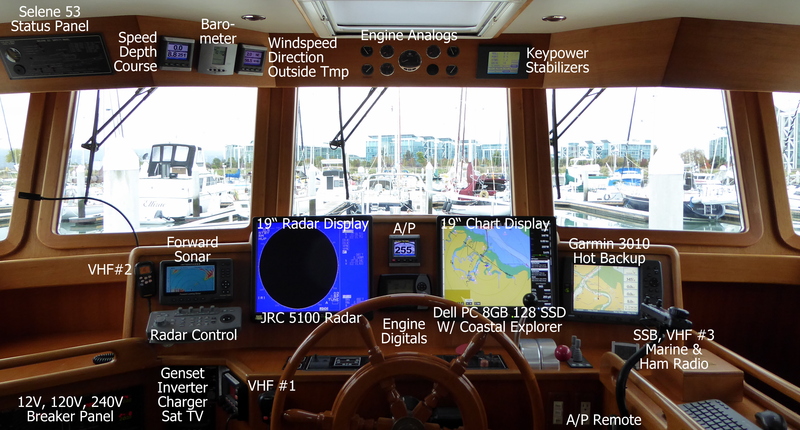 We've added a few new gadgets including an AIS Transponder that allows the ships and other boats to see us better on their chart plotters and radar. 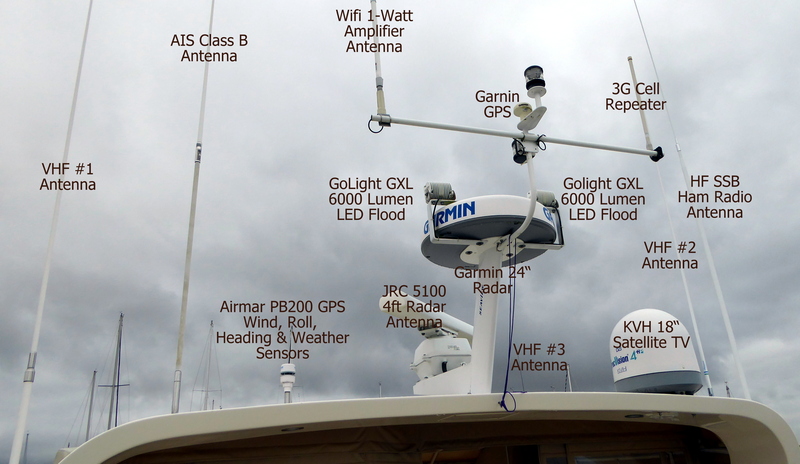 A new Wild Blue wifi access point allows the crew to have internet access on their laptop, iPhone, or PDA from anywhere on the boat, once the boat is connected. We've upgraded to a digital depth sounder which not only shows the big fish, but the bait fish underneath us. We completed the installation of our Single-Sideband radio which covers the marine and ham radio bands. Alex talked to ham radio stations in Alaska, Hawaii, and Japan from the boat, so it seems to work! In an emergency it even allows us to communicate with aircraft. We bought a new backup navigation PC that can be swapped out with the primary computer within minutes. After dragging bull kelp all over Alaska and BC last year, we had kelp deflectors installed in front of the active stabilizer fins. And finally, after scraping off a good portion of the bottom paint from our Princess Louisa Winter Cruise (see below), the boat received a new coat of bottom paint. Wild Blue's new bottom and stabilizer fin kelp deflectors. Many other boats are going up the Passage this year. We've communicated with quite a few by email. The weather looks to be warmer than last year and instead of $4.10 per gallon, boat fuel in Anacortes was $1.66 last week and we liked that a bunch. 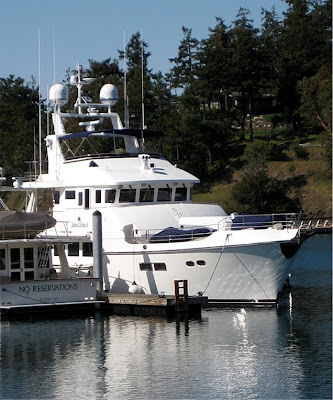 One group of boats we've been following online is the "Great Siberian Sushi Run", which is three trawler style yachts running from Seattle, up to Alaska, down the Aleutian Islands, west to Siberia, ending in Japan. 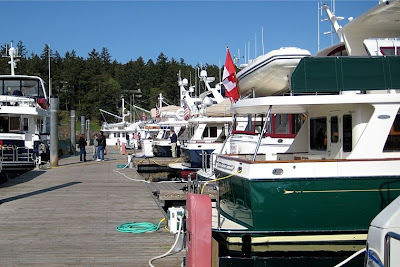 The boat named Sans Souci has a nice blog on www.nordhavn68.com and we met the owner at the Selene Rendezvous last week. The bearing sea ought to be a big challenge for these crews! 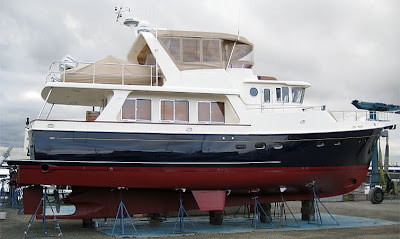 This Nordhavn 68 is going to Alaska then Siberia on the way to Japan. Another three boat flotilla is cruising to Alaska from Oxnard, California. You can follow them at sites.google.com/site/northtoalaska2009/Home . It should be a fun summer for us and our crews, and we're hoping to keep you informed via the Blog.